Lord Montaigne (1533–1592) was one of the most influential writers of the French Renaissance, known for popularising the essay as a literary genre. He became famous for his effortless ability to merge serious intellectual speculation with casual anecdotes and autobiography—and his work contains, to this day, some of the most widely influential essays ever written. Montaigne had a direct influence on writers the world over, including René Descartes, Jean-Jacques Rousseau, Ralph Waldo Emerson, Friedrich Nietzsche, Stefan Zweig, Eric Hoffer, Isaac Asimov, and perhaps William Shakespeare. Much of modern literary non-fiction has found inspiration in Montaigne and writers of all kinds continue to read him for his masterful balance of intellectual knowledge and personal story-telling. 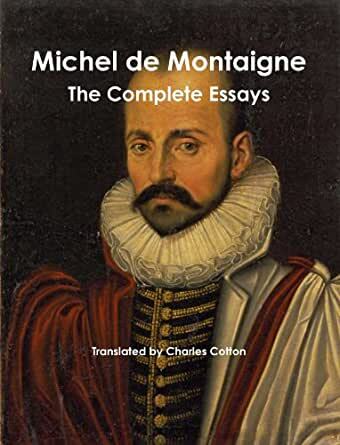 This complete collection of Montaigne's Essays consists of 107 essays that was first published in 1580, on which his reputation lies as the essential inventor of the literary form of essay. Montaigne's Essays are one of the more enjoyable massive tomes of renaissance writing available, and if reading in English, one has two major modern choices of translation, Screech and Frame. To start with Translation: Both major translations are excellent in their own way, but some differences are of note. When a translation is done, usually the translator will translate the major language of the text, French in this case, and leave quotes by the author from other languages, mostly Latin in this case, untranslated. The translator will provide a note with the translation of the quote, and preferably the source of the quote. This is where Screech and Frame differ considerably. Screech does what should be done, and Frame just translates everything into English with no significant notations other than the person quoted. This means, however, that one may prefer one translation over the other based on this alone. For example, one that wishes to take a more scholarly look will likely use Screech (or the original), and one that simply wants to read for pleasure may have no problem using the translation by Frame. Also, Screech is British and Frame is American, so one may have other preferences for style. The physical copies of Frame's translation (Stanford and Everyman's) are vastly superior to the Penguin Classics Screech version. The Penguin paperback is thick, but in keeping with the generally small form factor, the print is terribly small, and the paper is of a horrible quality, which is the reason I also purchased the Kindle version. The Penguin Classics Kindle file is much more pleasant to read and deal with than the paperback alternative. However, there are many errors in the Kindle version that are not present in the paperback version. It appears some items get corrected occasionally, but still, it is not nice to charge so much for the Kindle version, and not have it completely proofread and ready for primetime. This actually lead me to have a conversation with a Penguin representative about the quality of the Kindle version, and in that conversation, I learned something I had not realized before. Penguin does not produce the Kindle version. Amazon does. So, all of the quality issues I have noticed in the past about Kindle versions essentially are the fault of Amazon rather than the publisher listed. I suppose the publisher only sells Amazon license to produce the Kindle file and sets price limitations, and Amazon does the rest. This needs to change, because there needs to be more quality control. However, because of the limitations of the Penguin paperback, I would still recommend the Kindle version if one is to read Screech. Five stars for Montaigne's Complete Essays, regardless of which version one chooses to read. 5.0 out of 5 starsExcellent translation. I have three translations of Montaigne - Cotton, Frame (this one) and Screech (no kidding). The Cotton translation was done in the late 18th century and is some what difficult to read. Frame was done in the 1950's and is very readable. Screech is more recent and is also quite readable. Frame simply translates Montaigne's frequent Latin quotes whereas Screech presents the Latin along with the translation. While this may be more scholarly, it is distracting if you don't read Latin. The Frame volume includes other works by Montaigne such as his travel journals. Thus, it is more complete than either Cotton or Screech. This volume is over 1300 pages and is not very portable. Still I recommend it as being more complete and a little more readable. GREAT & CELEBRATED BOOK (difficult read), fast shipping, came exactly as described. This is the ONE for those who are ready to dive into the deepend. This is the serious one. Every essay is different and wonderful. I am attaching photographs of THIS version (Screech) so that you can see what you are diving into. My copy has been noted as I have been teaching him. The writer to publish the first personal essay, and most essays are short and intriguing in that they use psychology to communicate his messages. This is done through poetry, historical references, linguistics, theology, imaginary scenarios and intriguing language. every essay is a paradox. You do not need to know that, hence the enjoyable aspect. Montaigne has influenced writers/figures like Eliot, Freud, Shakespeare, Descartes and more. It's important only if you are interested (or are required) in understanding the translation process. Screech dives into the history that influenced Montaigne's essays. His introduction tells you a bit about Montaigne, but it is not that long and can be skipped. He also explains how he went about translating his version of this collection. There's stuff missing in a bunch of the collections because he has written so much. If you are looking for something rare or specific, you should look which book it is before purchasing. All of them are available on Amazon.. Some college professors are adamant that only this book be read. You might need to write papers with citations. This book is very different than the other books. Screech's is better for students and scholars. It includes citations and the very short Latin and French quotes that he uses, though all of it is translated into English for you. The Latin and French line/quotes/references are usually very short. The translations are right next to quotes in parenthesis. If you purchase a different collection, you will have a very difficult time with writing papers because of the varying translations. Overall, this is a phenomenal read produced by a prolific and prominent man. Screech does a great job. This is the best book of the collections that I have purchased, though it is the most difficult to understand. Again, this collection is more for scholars and academics. Montaigne is studied to this day, nearly as much as Shakespeare because of the sheer difficulty of the paradoxes presented, but, they are enlightening and enjoyable. In terms of literature, Montaigne is one of the "trickiest" reads (he calls himself tricky-- it is a bit of his trademark). The subject of this book is Michel de Montaigne, a 16th century frenchman, famous for writing this book. The topics he covers range from the wisdom of the ancient philosophers to everyday nuisances present in the life of the late 16th century. The overriding theme throughout is his focus on himself, the only subject he is sure that he knows better than anyone else. This book is valuable because he writes about subjects that are still relevant to today, over 400 years later, and will continue to be relevant throughout man's history to come. He asks questions that every human finds himself asking at some point. He focuses on ethics and theology and the human soul, and much more. His writing style is relaxing and candid. The book is broken up into numerous seemingly disjointed sections and can be read for 10 minutes or a couple hours at a time. Montaigne writes in a friendly tone but also covers plenty of serious subjects. This book is unique in providing what life was like for one man who lived over four centuries ago.